Aquatic Centers operated by universities, colleges, local public agencies, and nonprofit organizations, provide classroom and on-the-water boating safety education in kayaking, canoeing, water skiing, powerboating, sailing, personal watercraft operation, and other aquatic activities. Cal Adventures at UC Berkeley offers the opportunity to make memories, have adventures, and learn new skills on the water. Members of the public can take a sunset paddle class and catch amazing views of the Bay Area’s famous Golden Gate Bridge, learn to shred across the scenic San Francisco Bay in a windsurfing class, or try their hand at sailing in winds up to 15 knots. With no prior experience required, participants of all skill levels can take part in the unique class offerings at Cal Adventures. Address: 124 University Ave., Berkeley CA 94710. Lake Merritt Boating Center offers lake exploration on a variety of vessels including pedal boats, dragonboats, kayaks, sailboats, rowboats, and canoes. With youth programs beginning at age 7 and up and classes for all skill levels, the center has something for every water enthusiast. 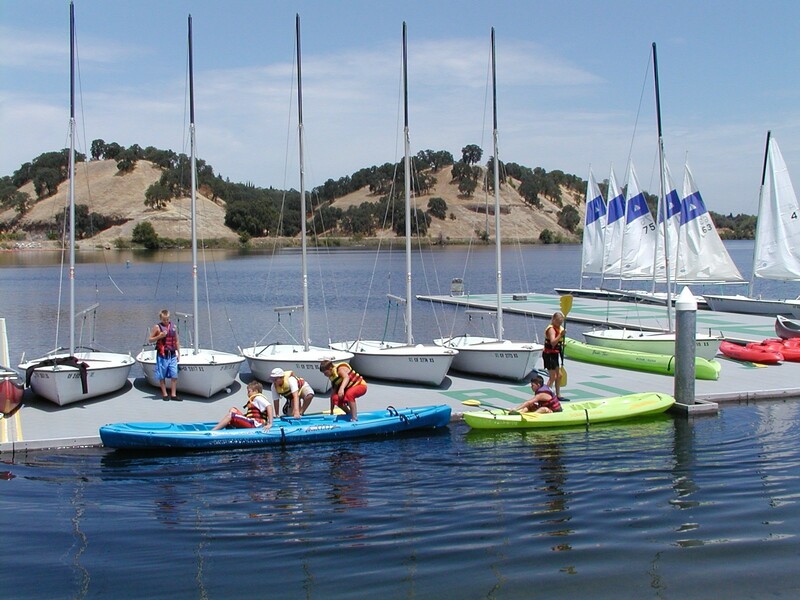 Advanced sailing classes take place at the Jack London Aquatic Center on the Oakland Estuary. The Cal Sailing Club is a non-profit, volunteer-run sailing and windsurfing club that offers lessons, recreation, and free programs for the general public and for summer programs. Members get lessons and, after achieving ratings, use of the club's fleet of 23 dinghies, 6 keelboats and 80 windsurfing boards including novice, intermediate, and advanced designs. Located on the south side of the Berkeley Marina, CSC's major activity is teaching sailing and windsurfing safety. A sampling of CSU Chico Adventure Outings offerings includes rafting on the South Fork of the American River, surfing in Santa Cruz, stand up paddleboarding and yoga on Juniper Lake, and inflatable kayaking on the Trinity River, just to name a few. Participants learn to develop a wide variety of on-the-water skills and water safety techniques. An equipment rental center is also available to the general public. Forebay Aquatic Center’s mission is to conduct instruction for safe boating and provide recreational watercraft for residents of Butte County and the surrounding area. The aquatic center offers summer youth camps, moonlight paddles, SUP yoga, sailing, kayaking, and rowing. At the Fresno River Sport Center, individuals can take a trip on the picturesque San Joaquin River Parkway while learning about water safety and river stewardship. Classes offered include stand up paddle, canoe, and kayak on beautiful Millerton Lake. Instructional river paddle trips and equipment rentals are also available. Humboldt State University’s recreation program, Center Activities, lets members of the community explore the bay on a kayak, canoe or a stand up paddleboard, learn and advance their sailing techniques, pick up surfing, or join a whitewater adventure. Students have the opportunity to get on the water, enjoy nature, and make new friends. Private Aquatic Instruction is also available as well as private group tours and aquatic gear rentals. The Marina Aquatic Center (MAC) is UCLA's premier water-front recreation facility just 10 miles from campus in scenic Marina del Rey. The MAC is home to kayaking, rowing, sailing, surfing, stand up paddleboarding and windsurfing classes, as well as youth boating programs. The Marina Aquatic Center is open to the public, and also offers group programs for adults and youth, private lessons, and equipment rentals. Founded in 1976, the California State University Northridge, Aquatic Center has become well known throughout the community for its excellence in boating and water safety education. The center, which is located at Castaic Lake Recreation Area in the scenic foothills of Santa Clarita Valley, is one of the largest boating education centers in the nation. The center offers classes in waterskiing, wakeboarding, wakeskating, sailing, windsurfing, kayaking, canoeing, and boating. The sailing program offered by Boys & Girls Clubs of Venice teaches youth skippers teamwork, leadership, responsibility, and critical thinking skills while learning boating safety and experiencing the adventures of sailing. Located in beautiful Alamitos Bay, the Long Beach Sea Base has offered boating and marine education to Boy Scouts of all ages since 1966. Cub Scouts, Boy Scouts and Sea Scouts can learn motorboating, sailing, kayaking, canoeing, stand-up paddleboarding, rowing, waterskiing, wakeboarding, fishing, safety, charting, navigation and more. In addition to the year round programs, the Long Beach Sea Base offers week long Spring and Summer Camps for Scouts as well as event space for Courts of Honor, meetings and banquets. Once envisioned solely as an Olympic training site, the United States Sailing Center at Long Beach has developed into a center of training for sailors of every ability and from all parts of the community. The Sailing Center offers sailors the skills necessary for success in the sport. Programs include Youth At-Risk activities through local help groups, Learn-to-Sail classes for all ages and disabled sailing opportunities through the Sailing Center's own Disabled Sailing Association. The Sailing Association at California State University, Long Beach focuses on sailing instruction for students of many skill levels. Students will learn sailing foundations, boating safety, boat handling skills, and racing tactics. The Association also hosts special field trips year-round, such as sails to Catalina and a holiday kayak through the Christmas lights of the Naples canals. Redondo Beach Recreation Department offers sailing classes for youth and adults with classes designed for a wide variety of skill levels. Classes include basic and intermediate small boat sailing, basic coastal sailing, coastal navigation, and basic keel boat sailing. Fun-filled youth summer sailing camps encourage camaraderie, self-reliance, teamwork, leadership, and respect for the environment. Youth camp students will learn basic to advanced skills, with racing elements included for more adventurous sailors. King Harbor Youth Foundation was founded in 1982 to promote youth sailing in Southern California. The non-profit serves individuals ages 8 and up with the goal of building self-esteem, teamwork, and respect for the environment. Programs include sailing instruction, competitive racing, and community outreach. Located in sunny San Rafael, Marin County, Sailing Education Adventures (SEA) is a premier community-sailing organization and has been delivering quality sailing education for over thirty years. The primary objective of the organization is to foster conservation and care of the San Francisco Bay marine environment through active, on-the-water and related experiences. Programs include on-the-water sailing instruction for youth and adults and environmental education. The Truckee-Donner Recreation & Park District offers adventurous on-the-water programs on picturesque Donner Lake. Summer youth sailing camps for ages 8-17 are created for various skill levels. In SUP Yoga, adults learn basic paddle skills, improve fitness, and participate in friendly competitions while practicing water safety techniques on the lake. UC Irvine Campus Recreation plans fun-filled outings for those who want to experience some on-the water fun on Newport Harbor. In addition to offering sailing, kayaking, and stand up paddle instruction, special events include sunset dinghy racing, SUP fitness, sunset paddles, full moon paddles, and a summer beach kickoff. Additionally, summer youth sailing camps introduce the fun of sailing, kayaking, and paddleboarding in ages 6-16. Orange Coast College of Sailing and Seamanship offers sealing and seamanship classes for every skill level. Located on beautiful Newport Harbor, the facility serves as a great place for beginners to learn to sail. More advanced sailors can take part in cruising classes to Catalina and Channel Islands. Powerboat training is also available for safe powerboat handling certification. Youth summer camps and instruction for sailing and powerboat handling are also offered by the aquatic center. Newport Sea Base, a youth aquatic facility operating since 1937, provides water safety and boating classes to individuals and family-fun activities on the water. Ages 6 and up can experience the fun of boating with a wide variety of activities available. Course offerings include sailing, motor boating, junior sailing, kayaking, paddleboarding, rowing, paddle sport adventure, fishing, and child boating safety. Located at the beautiful Orange County Sailing & Events Center, the Dana Point Aquatic Foundation aims to provide access to safe community boating with an emphasis on fostering diverse recreational, social, and cultural experiences for the general public. Classes offered include sailing, stand up paddle, STEM youth camp, adaptive boating, and much more. The Newport Bay Conservancy offers 2-hour guided tours of Upper Newport Bay in the heart of Newport Beach every Saturday and Sunday morning year-round. Participants often see pelicans, egrets, and other wildlife as they are led into the Ecological Reserve by a trained Naturalist. At various stops throughout the tour, Naturalist guides discuss various aspects of the changing ecology and wildlife of the Bay. Hit the open water and learn to sail across Lake Tahoe by taking a class with the Tahoe Community Sailing Program. Students as young as 6 can begin learning water safety techniques in the Intro to Aquatics program. More experienced sailors can learn to race around the lake in youth sailing clinics. The sailing program aims to develop solid sailing skills with an emphasis on safety, fun, and teamwork. Located in Quincy, California, the Outdoor Recreation Leadership program at Feather River College offers students the opportunity to take classes in sea kayaking, whitewater rafting, canoeing, stand-up paddleboarding, and whitewater kayaking. The program also allows students to earn certifications in whitewater guide school and water rescue. The City of Lake Elsinore boasts a precious resource in the largest Natural Freshwater Lake in Southern California. The lake offers exciting recreation opportunities available to residents and visitors. After a brief orientation, visitors can cruise around the lake on kayaks and stand up paddleboards. The Sacramento State Aquatic Center, located on Lake Natoma, is a state-of-the-art campus designed to provide high quality boating and safety programs through education, recreation, and competition for the entire Sacramento region. Youth camps and classes for the general public are offered in sailing, windsurfing, kayaking, wakeboarding, waterskiing, jet skiing, rowing and much more. The United States Adaptive Recreation Center (USARC) was founded in 1983 to ensure that access to skiing is available to individuals with varied abilities. 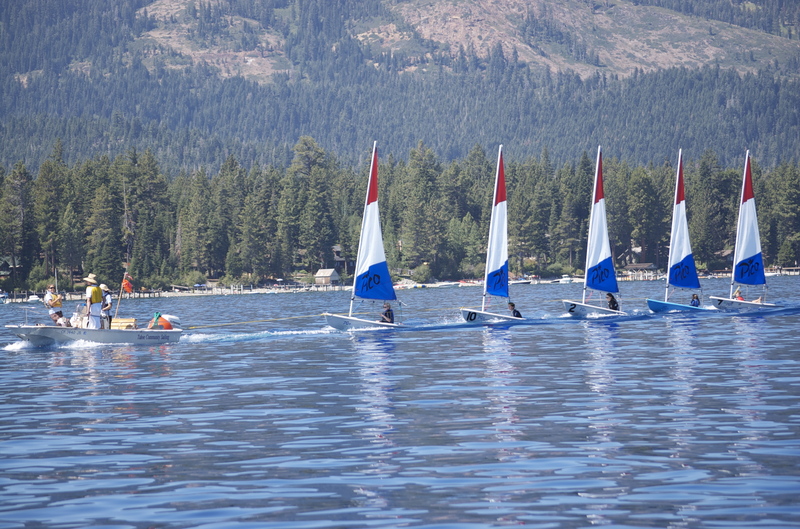 In the summer, the USARC takes to the fresh waters of Big Bear Lake for wet and wild waterskiing, jet skiing, kayaking, stand up paddle boarding, sailing, and fishing. Each participant is introduced to the excitement and adventure of watersports through the use of adaptive equipment, skilled recreation therapists, lifeguards, licensed boat operators, and expertly trained volunteers. Located in San Diego’s beautiful Mission Bay Park, the Mission Bay Aquatic Center is the ideal location for a wide variety of watersports. This centralized location allows for surfing the waves of San Diego beaches, rowing the sheltered waters of mission Bay, sailing the afternoon westerly winds, kayaking or paddleboarding the nearby coves, or riding the morning glassy waters on the best wakeboarding equipment and boats available. Individual, group, and youth lessons are available. The Crown Cove Aquatic Center (CCAC) is an off-campus center of Southwestern Community College District. Nestled between the cities of Coronado and Imperial Beach on the Silver Strand State Beach, CCAC provides a wide range of educational and recreational aquatic activities to the surrounding communities. The primary focus is to promote safe boating education and instruction through broad-based programs. Instruction is offered in canoeing, kayaking, sailing, stand up paddling, and surfing. San Diego Canoe Kayak Team is a non-profit organization focused on developing young athletes in Olympic-style sprint kayaking and canoeing, Ocean Surfski racing, and the exciting new sport of stand up paddleboard racing. 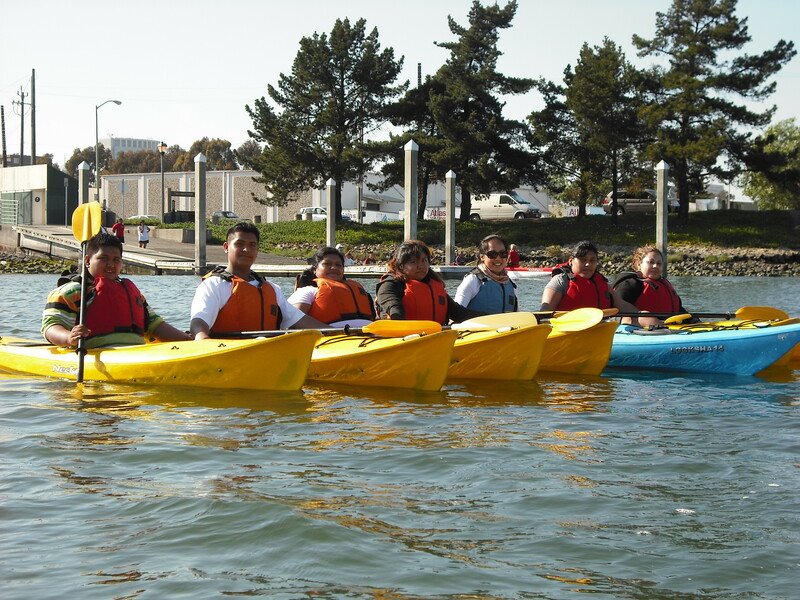 Campus Life Services at UC San Francisco gives the community a chance to learn how to paddle on a sea kayak. First timers to sea-kayaking can get a taste of the sport by registering for a Sausalito Moonlight Paddle. Courses designed for various skill levels are also offered by Outdoor Programs. 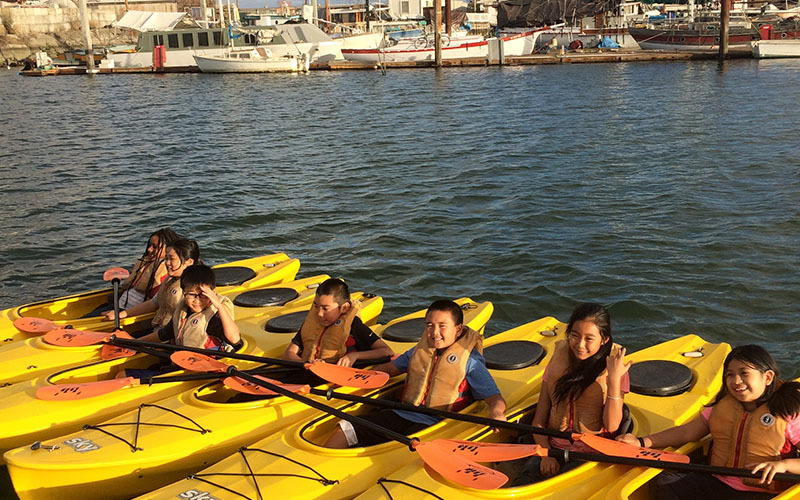 The San Francisco State Sailing and Paddling Program is a sailing, kayaking and stand-up paddleboarding safety and activity instruction curriculum and environmental education program on beautiful Lake Merced in San Francisco. Lake Merced is an ideal place for sailing, kayaking and stand-up paddling because of its sheltered waters, steady afternoon winds, and abundant wildlife in a beautiful environment, along with its close proximity to urban residents. San Francisco State offers youth sailing and paddling camps as well as an adult sailing program. Coined “the gateway to the San Francisco Bay,” the Treasure Island Sailing Center provides youth, adults, and families affordable access to sailing and water sports by offering a variety of sailing education and rental opportunities. Environmental Traveling Companions (ETC) trips enable participants to access the wilderness and develop an environmental stewardship ethic through sea kayaking, whitewater rafting, and more. Since 1972, ETC has shared outdoor adventures with disadvantaged youth and people of all ages, including those with visual or hearing-impairments, physical or developmental disabilities, and life-threatening illnesses. Outings are open to the general public. Along the San Joaquin River in Stockton lies a hidden gem; the Stockton Sailing Club is a great location for sailors of all levels to enhance their skills. Sailing courses for adults and youth allow anyone to develop a love for sailing while learning about proper boat handling, good sportsmanship, and innovation in all aspects of sailing. Everyone ages 10 and up can have fun learning to kayak, sail, or surf at the City of Carpinteria Parks and Recreation Department boathouse. Certified ocean lifeguards instruct students on techniques while they explore the nearby Carpinteria Reef and kelp beds. Private lessons are available for both surfing and kayaking. The University of California, Santa Barbara (UCSB) has provided students with sailing and boating classes since the late 1960s. Now, the Department of Recreation at UCSB leases a dock at the beautiful Santa Barbara Harbor, where boating and sailing safety classes are taught. UCSB offers surf, kayak, sail, and stand up paddle lessons. The University of California, Santa Cruz (UCSC) Community Boating Center is a community based boating program that takes pride in connecting students and community members to the Monterey Bay through the sports of sailing, rowing and kayaking. Over the past 45 years the UCSC Community Boating Center has taught over 30,000 members of the Santa Cruz area how to sail, row, kayak, windsurf and how to make educated decisions about our local waters, Monterey Bay. The City of Redding Parks and Recreation Department offers sailing, kayaking, and stand up paddling lessons. Youth programs and adult classes are designed for various skill levels. Visitors are invited to try a sunset paddle under the twinkling stars at Whiskeytown Lake. California State University Maritime Academy (Cal Maritime) offers a Coast Guard Auxiliary University Program, in which participants receive training and qualifications in boat operations, vessel exams, and marine safety. At beautiful Lake Ralphine, the City of Santa Rosa offers the opportunity to expand boating skills for beginners and give refreshers to more experienced boaters. Courses offered include youth boating camp, sailing, kayaking, and paddleboarding based on various skill levels. The Channel Islands Boating Center (CIBC) opened in April 2013 to provide educational and recreational opportunities for youth and adults of Ventura County, the CSU Channel Islands community, and others from our region. While the main focus is to teach boating skills and safe boating practices, the CIBC also provides other educational resources about our local marine environment. The lobby is filled with passive and interactive exhibits about the Channel Islands marine environment, natural history, and current preservation efforts. The public and groups are welcome to visit the CIBC. The goal of the Pacific Corinthian Youth Foundation is to develop skills in sailing, overall seamanship, racing, water safety, and sportsmanship while having lots of fun on the water. The summer sailing program is open to all area children, ages 8 to 18. Outdoor Adventures at University of California, Davis offers whitewater rafting and kayaking trips to spectacular natural areas in California and beyond. The program is open to all UC Davis students and community members 18 years or older.